STOKE suffered a fourteen-point defeat as they were stung by the Coventry Bees’ 52-38 at the Paul Chapman & Sons Arena on Sunday afternoon. The Bees’ sharpness from the gate and all-round team strength showed put the Potters on the back foot with six of the Potters side sitting on the bike for the first time since October. Max Clegg top scored for the A.R. Richards Potters and he received solid support from skipper Tony Atkin and Rob Shuttleworth with Atkin admitting that his arms were being pulled from their sockets in his final ride because of the lack of track time due to the weather. The meeting ran with drizzle continuing throughout the match and it was the Bees’ that went into a comfortable lead after leading 16-8 as Shuttleworth took the Potters first race win of the afternoon in heat four defeating former Potter Danny Phillips. Clegg followed suit in the following heat as he got the better of Jon Armstrong with Paul Burnett taking third for a Potters 4-2 heat advantage. 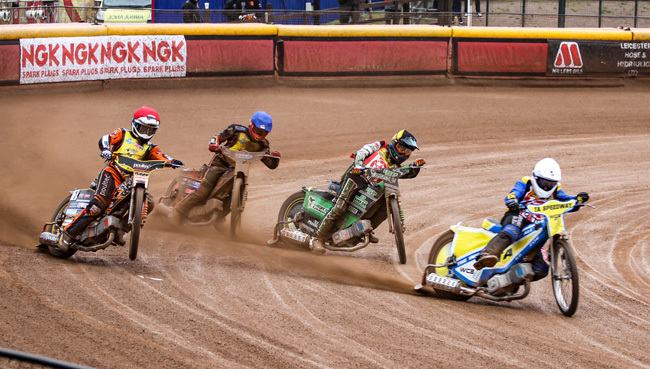 The Bees’ gained three 4-2 heat advantages mid-meeting to open up a twelve-point lead before Clegg took his second victory of the afternoon over Jamie Halder who led the Potters heat-leader before being past. A further couple of 4-2’s sealed victory for Coventry with the Potters taking a consolation 4-2 in the final race at Clegg had to use all his track craft to drive around the outside of Connor Mountain to prevent Mountain taking a full maximum with Shuttleworth taking third place. SCB referee Tony Steele thanked both sets of riders for their performances in what were difficult conditions. COVENTRY 52: Connor Mountain 14, Jon Armstrong 11, Danny Phillips 6+1, Ryan MacDonald 6+1, Jamie Halder 5+2, Luke Harris 5, Luke Ruddick 5. STOKE 38: Max Clegg 13, Tony Atkin 9, Rob Shuttleworth 8, Adam Extance 3+1, Paul Burnett 3, William O’Keefe 2+1, Joe Alcock 0.